To define abnormal labor, a definition of normal labor must be understood and accepted. Normal labor is defined as uterine contractions that result in progressive dilation and effacement of the cervix. By following thousands of labors resulting in uncomplicated vaginal deliveries, time limits and progress milestones have been identified that define normal labor. Failure to meet these milestones defines abnormal labor, which suggests an increased risk of an unfavorable outcome. Thus, abnormal labor alerts the obstetrician to consider alternative methods for a successful delivery that minimize risks to both the mother and the infant. Dystocia of labor is defined as difficult labor or abnormally slow progress of labor. Other terms that are often used interchangeably with dystocia are dysfunctional labor, failure to progress (lack of progressive cervical dilatation or lack of descent), and cephalopelvic disproportion (CPD). The first stage starts with uterine contractions leading to complete cervical dilation and is divided into latent and active phases. In the latent phase, irregular uterine contractions occur with slow and gradual cervical effacement and dilation. The active phase is demonstrated by an increased rate of cervical dilation and fetal descent. The active phase usually starts at 3-4 cm cervical dilation and is subdivided into the acceleration, maximum slope, and deceleration phases. The second stage of labor is defined as complete dilation of the cervix to the delivery of the infant. The third stage of labor involves delivery of the placenta. 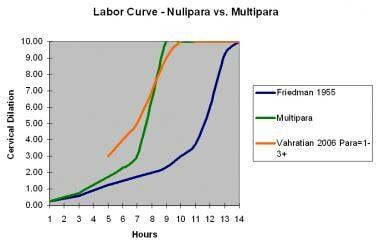 See images below for the normal labor curves of both nulliparas and multiparas. The following table shows abnormal labor indicators. 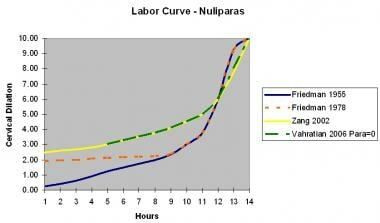 Labor curve for nulliparas versus multiparas. Contemporary practice with supporting data suggest that the duration of labor appears longer today than in the past. 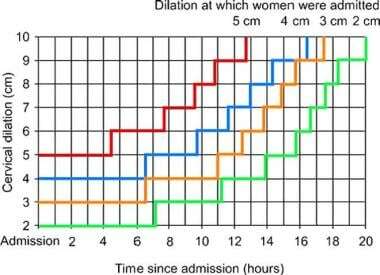 For both nulliparous and multiparous women, labor may take longer than 6 hours to progress from 4 cm to 5 cm and longer than 3 hours to progress from 5 cm to 6 cm of dilation. Cervical dilation of 6 cm appears to be a better landmark for the start of the active phase. The 95th percentile for duration of the second stage in a nulliparous woman with conduction anesthesia is closer to 4 hours. Note the charts below. Average labor curves by parity in singleton term pregnancies with spontaneous onset of labor. Reprinted from Seminars in Perinatology, Vol 36(5), El-Sayed YY, Diagnosis and Management of Arrest Disorders: Duration to Wait, pgs 374-8, Oct 2012, with permission from Elsevier. The 95th percentiles of cumulative duration of labor from admission among singleton term nulliparous women with spontaneous onset of labor, vaginal delivery, and normal neonatal outcomes. Reprinted from Seminars in Perinatology, Vol 36(5), El-Sayed YY, Diagnosis and Management of Arrest Disorders: Duration to Wait, pgs 374-8, Oct 2012, with permission from Elsevier. As stated above, first stage of labor is divided into latent and active phases. According to Friedman et al., latent stage considered to be prolonged if takes >20 hours for nulliparous women and >14 hours for multiparous women. However, prolonged latent phase does not usually lead to any clinically significant adverse events for mother or the infant. Therefore, diagnosis of abnormal labor during the latent phase is uncommon and is not relevant for clinical practice. Around the time uterine contractions cause the cervix to become 3-4 cm dilated, the patient usually enters the active phase of the first stage of labor, according to the traditional definition. Abnormalities of cervical dilation (protracted dilation and arrest of dilation) as well as descent abnormalities (protracted descent and arrest of descent) as described historically are outlined in the Table above. The Consortium on Safe Labor also addressed the 95th percentile for the second stage for nulliparous women; it was 2.8 hours (168 min) without regional anesthesia and 3.6 hours (216 min) with regional anesthesia. For multiparous women, the 95th percentiles for second-stage duration with and without regional anesthesia remained around 2 hours and 1 hour, respectively. [6, 7] However, other studies demonstrate the risks of both maternal and perinatal adverse outcomes rising with increased duration of the second stage, particularly for durations longer than 3 hours in nulliparous women and 2 hours in multiparous women. One study found that if nulliparous women delivered after prolonged second stage, they were twice as likely to have operative vaginal delivery, three times as likely to develop chorioamnionitis, have higher odds of having episiotomy and 3rd or 4th degree lacerations, and one day longer median hospital stay. .Thus, careful clinical assessment of fetal and maternal well-being must be confirmed when extending the duration of the first and second stages of labor. The third stage of labor is the time from delivery of the infant to placental delivery. Historically, the duration of a normal third stage of labor was defined as less than 30min. This threshold was established by the study conducted by Combs et al. in 1991, in which 75% of placentas were delivered by 10 minutes and maternal morbidity and mortality increased if the third stage was increased beyond 30 min. However, a recently published article by Frolova et al, puts this definition into a question. In this study, the researchers found that in a modern cohort, 90% of placentas are delivered within 10 minutes and the risk of postpartum hemorrhage almost doubles by the time the duration of third stage reaches twenty minutes. Therefore, the traditional definition of prolonged third stage being >30 min, may be outdated and in need of revision. A prolonged latent phase may result from oversedation or from entering labor early with a thickened or uneffaced cervix. It may be misdiagnosed in the face of frequent prodromal contractions. 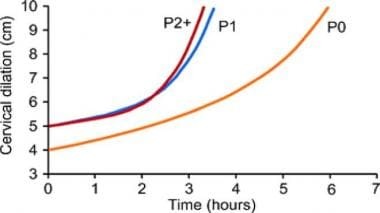 Protraction of active labor is more easily diagnosed and is dependent upon the 3 P' s.
The first P, the passenger, may produce abnormal labor because of the infant's size (eg, macrosomia) or from malpresentation. The second P, the pelvis, can cause abnormal labor because its contours may be too small or narrow to allow passage of the infant. Both the passenger and pelvis cause abnormal labor by a mechanical obstruction, referred to as mechanical dystocia. Of all cephalic deliveries, 8-11% are complicated by an abnormal first stage of labor. Dystocia occurs in 12% of deliveries in women without a history of prior cesarean delivery. Dystocia may account for as many as 60% of cesarean deliveries. Both maternal and fetal mortality and morbidity rates increase with abnormal labor. This is probably an effect-effect relationship rather than a cause-effect relationship. Nonetheless, identification of abnormal labor and initiation of appropriate actions to reduce the risks are matters of some urgency. Friedman EA. Primigravid labor; a graphicostatistical analysis. Obstet Gynecol. 1955 Dec. 6(6):567-89. [Medline]. Zhang J, Troendle JF, Yancey MK. Reassessing the labor curve in nulliparous women. Am J Obstet Gynecol. 2002 Oct. 187(4):824-8. [Medline]. Rouse DJ, Owen J, Hauth JC. Criteria for failed labor induction: prospective evaluation of a standardized protocol. Obstet Gynecol. 2000 Nov. 96(5 Pt 1):671-7. [Medline]. Cheng YW, Hopkins LM, Caughey AB. How long is too long: Does a prolonged second stage of labor in nulliparous women affect maternal and neonatal outcomes?. Am J Obstet Gynecol. 2004 Sep. 191(3):933-8. [Medline]. Rinehart BK, Terrone DA, Hudson C, Isler CM, Larmon JE, Perry KG Jr. Lack of utility of standard labor curves in the prediction of progression during labor induction. Am J Obstet Gynecol. 2000 Jun. 182(6):1520-6. [Medline]. El-Sayed YY. Diagnosis and management of arrest disorders: duration to wait. Semin Perinatol. 2012 Oct. 36(5):374-8. [Medline]. Zhang J, Landy HJ, Branch DW, et al. Contemporary patterns of spontaneous labor with normal neonatal outcomes. Obstet Gynecol. 2010 Dec. 116(6):1281-7. [Medline]. [Full Text]. Arulkumaran S, Koh CH, Ingemarsson I, Ratnam SS. Augmentation of labour--mode of delivery related to cervimetric progress. Aust N Z J Obstet Gynaecol. 1987 Nov. 27 (4):304-8. [Medline]. Harper LM, Caughey AB, Roehl KA, Odibo AO, Cahill AG. Defining an abnormal first stage of labor based on maternal and neonatal outcomes. Am J Obstet Gynecol. 2014 Jun. 210 (6):536.e1-7. [Medline]. Allen VM, Baskett TF, O'Connell CM, McKeen D, Allen AC. Maternal and perinatal outcomes with increasing duration of the second stage of labor. Obstet Gynecol. 2009 Jun. 113(6):1248-58. [Medline]. Laughon SK, Berghella V, Reddy UM, Sundaram R, Lu Z, Hoffman MK. Neonatal and maternal outcomes with prolonged second stage of labor. Obstet Gynecol. 2014 Jul. 124 (1):57-67. [Medline]. Frolova AI, Stout MJ, Tuuli MG, López JD, Macones GA, Cahill AG. Duration of the Third Stage of Labor and Risk of Postpartum Hemorrhage. Obstet Gynecol. 2016 May. 127 (5):951-6. [Medline]. Cunningham FG, Leveno KL, Bloom SL, et al. Abnormal labor. Williams Obstetrics. 22nd ed. Appleton & Lange; 2007. 415-434. Anim-Somuah M, Smyth R, Howell C. Epidural versus non-epidural or no analgesia in labour. Cochrane Database Syst Rev. 2005 Oct 19. CD000331. [Medline]. Gabbe SJ, O'Brien WF, Cefalo RC. Labor and delivery. Obstetrics: Normal and Problem Pregnancies. 5th ed. 2007. 322-326. Sanchez-Ramos L, Quillen MJ, Kaunitz AM. Randomized trial of oxytocin alone and with propranolol in the management of dysfunctional labor. Obstet Gynecol. 1996 Oct. 88(4 Pt 1):517-20. [Medline]. Mitrani A, Oettinger M, Abinader EG, Sharf M, Klein A. Use of propranolol in dysfunctional labour. Br J Obstet Gynaecol. 1975 Aug. 82(8):651-5. [Medline]. Roth C, Dent SA, Parfitt SE, Hering SL, Bay RC. Randomized Controlled Trial of Use of the Peanut Ball During Labor. MCN Am J Matern Child Nurs. 2016 May-Jun. 41 (3):140-6. [Medline]. Tussey CM, Botsios E, Gerkin RD, Kelly LA, Gamez J, Mensik J. Reducing Length of Labor and Cesarean Surgery Rate Using a Peanut Ball for Women Laboring With an Epidural. J Perinat Educ. 2015. 24 (1):16-24. [Medline]. Cheng YW, Kaimal AJ, Snowden JM, Nicholson JM, Caughey AB. Induction of labor compared to expectant management in low-risk women and associated perinatal outcomes. Am J Obstet Gynecol. 2012 Dec. 207(6):502.e1-8. [Medline]. Smyth RM, Alldred SK, Markham C. Amniotomy for shortening spontaneous labour. Cochrane Database Syst Rev. 2007 Oct 17. CD006167. [Medline]. Le Ray C, Serres P, Schmitz T, Cabrol D, Goffinet F. Manual rotation in occiput posterior or transverse positions: risk factors and consequences on the cesarean delivery rate. Obstet Gynecol. 2007 Oct. 110 (4):873-9. [Medline]. Shaffer BL, Cheng YW, Vargas JE, Caughey AB. Manual rotation to reduce caesarean delivery in persistent occiput posterior or transverse position. J Matern Fetal Neonatal Med. 2011 Jan. 24 (1):65-72. [Medline]. Mollberg M, Hagberg H, Bager B, Lilja H, Ladfors L. Risk factors for obstetric brachial plexus palsy among neonates delivered by vacuum extraction. Obstet Gynecol. 2005 Nov. 106(5 Pt 1):913-8. [Medline]. Shields SG, Ratcliffe SD, Fontaine P, Leeman L. Dystocia in nulliparous women. Am Fam Physician. 2007 Jun 1. 75(11):1671-8. [Medline]. Oppenheimer LW, Labrecque M, Wells G, et al. Prostaglandin E vaginal gel to treat dystocia in spontaneous labour: a multicentre randomised placebo-controlled trial. BJOG. 2005 May. 112(5):612-8. [Medline]. Butchart AG, Mathews M, Surendran A. Complex regional pain syndrome following protracted labour*. Anaesthesia. 2012 Nov. 67(11):1272-4. [Medline]. Treacy A, Robson M, O'Herlihy C. Dystocia increases with advancing maternal age. Am J Obstet Gynecol. 2006 Sep. 195(3):760-3. [Medline]. Zhu BP, Grigorescu V, Le T, et al. Labor dystocia and its association with interpregnancy interval. Am J Obstet Gynecol. 2006 Jul. 195(1):121-8. [Medline]. Zuo Z, Goel S, Carter JE. Association of cervical cytology and HPV DNA status during pregnancy with placental abnormalities and preterm birth. Am J Clin Pathol. 2011 Aug. 136(2):260-5. [Medline]. Friedman EA. Labor in multiparas; a graphicostatistical analysis. Obstet Gynecol. 1956 Dec. 8(6):691-703. [Medline]. Hoffman MK, Vahratian A, Sciscione AC, Troendle JF, Zhang J. Comparison of labor progression between induced and noninduced multiparous women. Obstet Gynecol. 2006 May. 107(5):1029-34. [Medline]. Vahratian A, Hoffman MK, Troendle JF, Zhang J. The impact of parity on course of labor in a contemporary population. Birth. 2006 Mar. 33(1):12-7. [Medline]. Wood S, Ross S, Sauve R. Cesarean section and subsequent stillbirth, is confounding by indication responsible for the apparent association? An updated cohort analysis of a large perinatal database. PLoS One. 2015. 10(9):e0136272. [Medline]. Chaiworapongsa T, Romero R, Whitten AE, et al. The use of angiogenic biomarkers in maternal blood to identify which SGA fetuses will require a preterm delivery and mothers who will develop pre-eclampsia. J Matern Fetal Neonatal Med. 2015 Aug 25. 1-15. [Medline].